If you're looking at either replacing your factory sights - or looking at factory options of upgraded sights - then the options that will jump out at you are night sights vs fiber optic. They stand out more than the typical three-dots and should make for better shooting. So which is better? Well, it's a little subjective. Each has their relative pros and cons. Ultimately, you'll probably find one is better for you because it just works better for you, and that's going to be the kind you want. That said, let's go over this a little more. 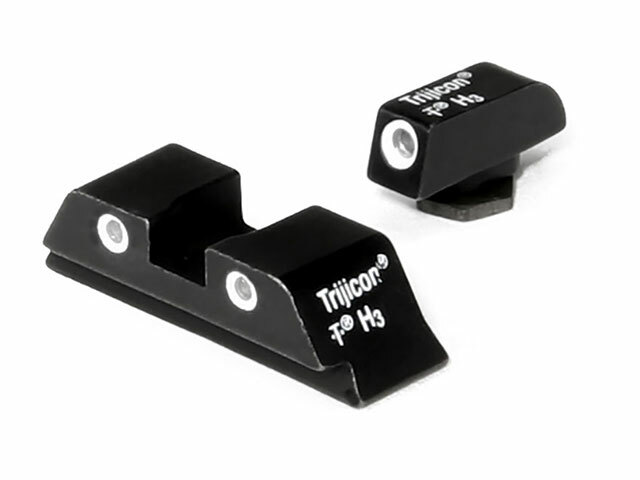 One of the most common sight upgrade is to get fiber optic sights in lieu of iron sights or three dots. They have two distinct advantages: they pick up light very well, making them more visible, and they tend to be very cost-effective as far as upgrades go. How fiber-optic sights work is due to the properties of fiber optic cables. The short version is that they're made with a reflective outer cladding and non-reflective core, but both materials are not very refractive, so they don't bend light. When light is picked up, the outer cladding reflects light throughout the core of the cable. Imagine a bowling ball with bumpers or a light source being bounced from mirror to mirror to mirror. In the presence of most light levels, they light up and stand out. That makes your front sight (and/or rear sights if all three have fiber optic inserts) a whole lot easier to see. They also tend to be cheap! Look at some aftermarket suppliers and you'll notice fiber optic gun sights tend to go for about half of what night sight sets go for. 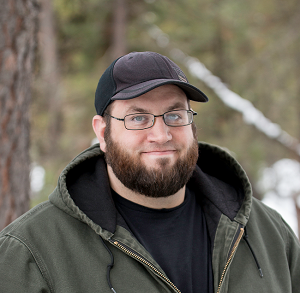 (Expect $50 to $75 in many instances, vs $125 to $175 for tritium night sights.) That means you can upgrade for cheaper, should that matter to you. You get your choice of color; green, yellow and red are most common, but blue and orange are out there. Thing about fiber optics is the sight itself is a housing and then the cable itself. You trim a length of fiber optic cable and insert it. If you don't like the color, you can just swap it out with the right diameter and length of cable if so desired. 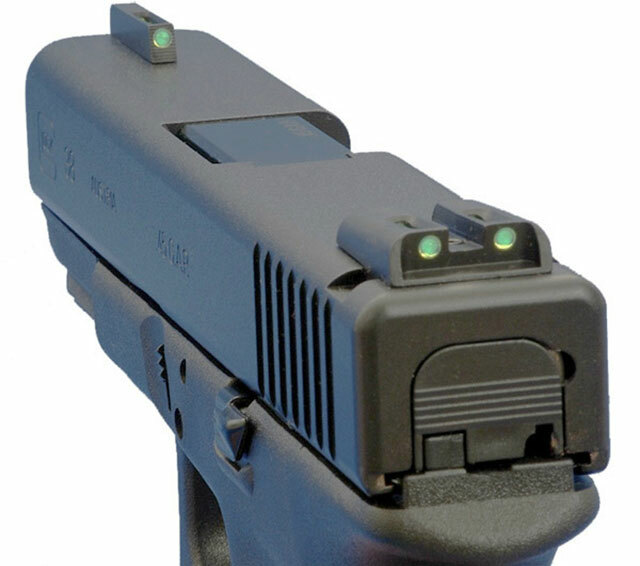 Night sights, or more accurately, tritium night sights, use radiation to produce a small amount of light in the absence of visible light. Mwa ha ha ha! The good news is that tritium emits negligible levels of beta radiation, so they're perfectly safe, unless you took out the tritium and swallowed it. 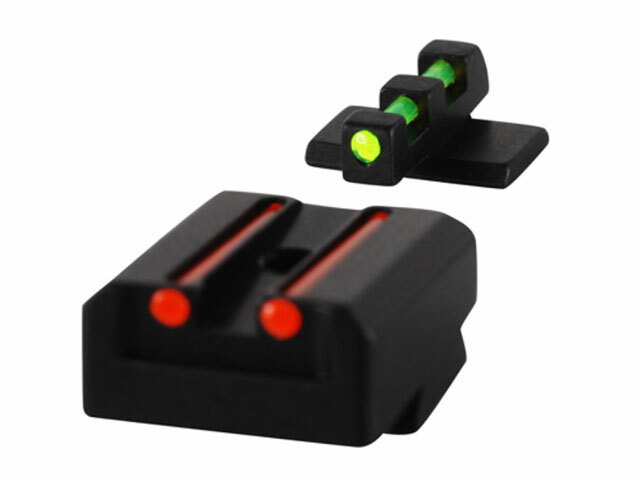 How tritium night sights work is by radioluminescence. Tritium emits beta particles at all times, but said particles happen to react with phosphorescent materials to create light. Basically, tritium gives off particles at all times. If you put some sort of phosphorescent material next to it, the phosphorus lights up for a period of time, creating a light source. That's why they put it on exit signs, watch dials and handgun sights. The tritium does have to periodically be charged by shining a flashlight on it, but that's how it works. The sights are made by placing a small glass tube with a bit of tritium gas inside it, almost like a little glass bead or small disk. That gets coated with phosphorescent paint, usually white, green or red. This creates phosphorescent light that you'll see in low-light environments. The hitch, of course, is that they are expensive as they will add to the purchase price of a factory gun and/or will cost a bit to get from a third party. (Expect somewhere between $125 to $175 in many cases.) However, they do work very well, which is why night sights are standard equipment these days for police guns. So...which is better between night sights vs fiber optics? Well...this is where it all gets a little weird, so you may want to strap yourself in. 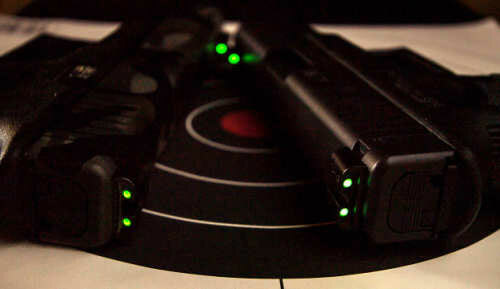 Tritium night sights are a bit better in the dark, though some fiber optics (red FO, for instance) are still quite visible in low-light environments. By comparison, fiber optics stick out like a sore thumb in the daylight and tritium night sights pretty much look just like white three dot sights. Granted, there are some sight sets made by third parties that incorporate both, most notably Tru-Glo TFO and TFX sights. You will, however, spend to get them! Here's where the wicket starts to get a bit sticky. You see, night sights, on paper, seem better because you can see better at night and that's when a lot of crimes happen. However, the civilian doesn't have to worry about that as much. Most defensive shootings occur in or around the home, and in urban and suburban locations. There are some in retail locations, the odd shooting out on the street, but most occur in or just outside the home. What, pray tell, do the sights have to do with this? These are all well-lit areas. In other words, night sights work better in the dark but you're arguably not going to really need them unless you're a cop. Heck, a lot of police shootings occur in well-lit areas as well. Also, you know good and well that virtually all of the shooting you'll do with your gun is either indoors or outside in good weather at a gun range. This matters because you'll see fiber optics better while doing so. That's also why fiber optic front sights are on so many shotguns these days; you pick them up incredibly well. That said, you could also go old-school and get a gold bead or gold insert instead. How come? Gold reflects light very well, even in low-light environments. Also gives your gun a touch of class. Granted, this is all well and good to talk about, but you need to find out which is going to be better for you. Go handle some guns with fiber optic sights and some with night sights. If you find that you like the night sights more, then get those. If you find you like fiber optic sights more, get those. Whichever you find is best for you is better for you, and that's what you should have on your gun.